Sarah Crabtree Gill and my great-grandmother Rachel Crabtree were daughters of Elijah and Priscilla Crabtree. 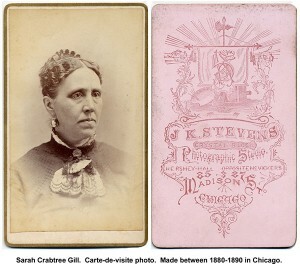 Sarah was a favorite aunt of my grandmother Myrtie Crabtree Briggs. The next few posts will be photos of Sarah and/or her family. Continuing with information from Cal Bivens. 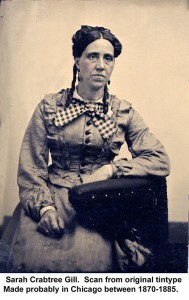 A Civil War pension application was filed in May of 1866 for Priscilla Crabtree, John’s mother. The claim was rejected due to the death of mother, Priscilla in January of 1868. It seems to me that it took an unusually long time to settle John’s military accounts and the pension application. Elijah had to file for his own, which was done December 10, 1866, the application number was: 138,708. Albert Babcock, a lawyer from Blackberry, in Kane County, was obtained to assist with the paperwork. Milt Thornton and Freeman Woodman made declarations for this filing. Thornton, a family friend, stated that John had worked for him for a year before his enlistment, and that his wages had gone to support his elderly parents. The same was true of his army pay. He further stated that after John’s death, Elijah had received help from the county and the community, he had 3 cows and a shanty that was built on Thornton’s land. Woodman swore to his acquaintance with Elijah and his knowledge of Elijah’s situation. An affidavit by Sarah M. Gill and George W. Giggey of Kane County, Illinois declared that they had been for 20 years intimately acquainted with Elijah and Pricilla Crabtree of Kane County that on January 30, 1868 Pricilla Crabtree, wife of Elijah, died at the township of Virgil. They were present when she died and was buried. That Elijah Crabtree “is a cripple caused by chronic rheumatism and that he has no property nor money nor any other means of support.” And that he was entirely dependent upon his son John Crabtree who was a corporal in Company B, 16th US Infantry who died in the service on or about January 1, 1863. The affidavit bore the signatures of both parties – Mrs. Sarah M. Gill & George W. Giggey. Later that year Elijah moved with Arnold and Rachel to Story County, Iowa. They settled in Nevada, in Milford Township. Elijah was working at farming then as best he could. Part 3 continues the file on Elijah Harris Crabtree from Cal Bivens. By 1860 the family was settled in a pretty compact area, clustered in Virgil Township, Kane County, Illinois. They were roughly 40-45 miles west of Chicago. Arnold and Rachel Crabtree lived near his sister and brother-in-law, Frances and Edmund H. Wallace. Richard and Mary Crabtree lived a ways away from them. Elijah seems to have already been established in the “shanty” on Milt Thornton’s land. George Giggy and William Crabtree were close neighbors near Elijah and Milt Thornton. Farther down the road lived the Fillmores and the Reads. I want to back up a bit to Milt Thornton. This is because he seems to have been a good friend of the family. Milton Thornton arrived in Kane County in May 1837, at a time when the cabins of the settlers were few and far between. He was a native of New Hampshire, born in Grafton County, October 20, 1809. His father, William Thornton, was also a native of New Hampshire and a direct descendant of Matthew Thornton, one of the signers of the Declaration of Independence. His wife was Polly Bagley, a daughter of Winthrop Bagley, a soldier in the Revolutionary War. Milton Thornton was mostly self-educated, his knowledge was of a practical nature acquired in adulthood. He came west by way of the New York and Erie Canal and the Great Lakes, to Chicago, and crossed the Fox River at Geneva May 24, 1837. He at once took up a claim in the town of Virgil, Kane County, comprised of 275 acres, on which he built a house, and began its improvement. In his early life, Mr. Thornton was an old-line Whig, and cast his first presidential vote for Henry Clay in 1832. Being a strong anti-slavery man, and a believer in equal rights for all, he voted for John C. Fremont, in 1856, and afterword became a staunch Republican. At the time the Crabtrees knew him, Milt was married to his second wife, Paulina Bunker. At various times he served as township supervisor, justice of the peace, and road commissioner. You are currently browsing the Relatively Speaking weblog archives for September, 2014.